And these blockbusters kept getting bigger. In the late nineties, every time a new action movie would introduce a groundbreaking special effect (Terminator 2’s morphing cyborg, The Matrix’s bullet time), studios would scream their mantra, “Raise the bar!” Audiences, already jaded by the last monster they saw, demanded ever more astonishing special effects, and moviemakers raced to outspectacle each other. Paired with big movie stars, such a formula got expensive and risky, fast. Recall that Keanu Reeves was paid a whopping $30 million upfront to make back-to-back Matrix sequels, but that his paycheck ultimately amounted to roughly $165 million, as his deal promised him an astonishing 15 percent of the final two films’ $1.1 billion (that’s with a “b,” people!) in worldwide grosses. And if a cast gets too expensive, well, Hasta la vista, baby! Reboot or prequel-ize, refresh the brand, expand its universe, and, most important, bring in cheaper actors who won’t gobble your profits. When You’ve Got a Brand, Who Needs a Name? The roots of the idea of star replacement can be found in the James Bond movies. (The series’ longtime producers, the Broccolis, have always refused to give their spy-of-the-moment profit participation; when Pierce Brosnan started asking, he was retired.) But the idea really took hold as a profitable solution when Fox wanted to do a fifth Alien movie, but it would cost over $20 million to get Sigourney Weaver. Instead, in 2004 they made AVP: Alien vs. Predator for around $40 million with no stars: Including video sales, the film made some $92 million for the studio. Mind you, that’s profit, not grosses — which is to say roughly double what Fox made from 2006’s star-packed X-Men: The Last Stand, which cost five times as much. Yes, some prequels fail on every level (Dumb and Dumberer), but they make a lot more when they don’t. As for whether they’re better or worse without the original stars, ultimately, that doesn’t matter: They’re cheaper, so there’s less pressure to be good. Kinberg is seeing this trend happen firsthand with two of his projects. He wrote the 2005 hit Mr. & Mrs. Smith, which the Fox-based mini-studio New Regency is in the process of rebooting without Mr. Pitt-Jolie or Mrs. Jolie-Pitt: After all, they would command 40 percent of the gross if they returned, assuming they weren’t already booked up through the year 2047. So Fox’s idea is to spin it off as something called Mr. & Mrs. Jones — about another pair of married spies with an ampersand — and if it ever gets made, it will star far smaller, cheaper fish. 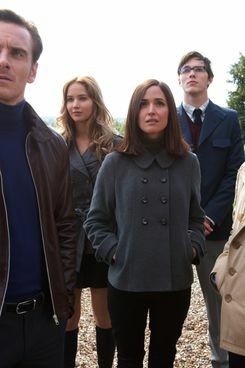 Kinberg’s X-Men: First Class is a more tangible case of casting downward while maintaining a healthy brand. It centers around the familiar characters of Magneto and Professor Xavier, which justifies its marketing under the X-Men brand, but it’s a prequel, which means it stars all new actors, mostly up-and-coming. They won’t strain the budget, let alone take a piece of the gross. 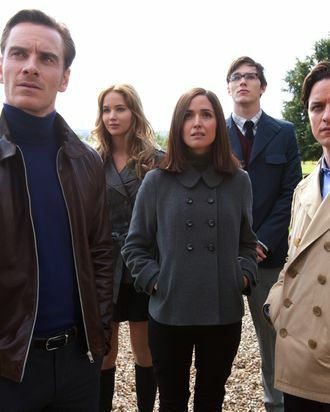 Fox declined to comment on its development, but a studio insider familiar with the development of X-Men: First Class agrees with Ratner’s assessment, explaining, “The success or failure of these movies is in the back-end participation.” If you pool the paychecks of First Class stars James McAvoy, Michael Fassbender, Jennifer Lawrence, and Nicholas Hoult, they likely don’t add up to what it would cost to get, say, Mark Wahlberg, who usually commands $10 million and 8 percent of the gross. Okay, so you’ve cast a talented, gorgeous unknown as your lead. What happens when the reboot succeeds wildly, and the once guppy-sized star becomes a really popular whale? Again, the new Hollywood math favors the house, not the players. One talent agent notes the story of Chris Pine: After appearing as Captain Kirk in J.J. Abrams’s reboot of Star Trek for Paramount, which was the highest-grossing film of the summer of 2009, he became highly sought-after by every studio in town. But Pine’s ability to be considered for even bigger roles, such as the lead in Universal’s reboot of The Bourne Legacy, has been hampered by the contract Paramount negotiated with him to do Star Trek. For example, they wanted him for their reboot of Tom Clancy’s Jack Ryan franchise, and per that original contract they had the right to make him do it, and he came relatively cheap. And for a star plucked from total obscurity, such as Thor star Chris Hemsworth, Marvel could easily have demanded four or five such options. These newbies have very few cards to play: Ridley Scott wanted Michael Fassbender for his Alien prequel, and when the actor’s agents pressed for a better deal, they were surprised that the director and the studio were more than willing to cast someone else. Suddenly, Team Fassbender was forced to backpedal furiously; the last offer was just fine, thank you. Yes, eventually these actors will serve out their contracts and demand more cash, but by that point the franchise will probably have burned itself out, and, hey, time for a reboot! Now, the studios aren’t entirely counting stars out. They can still help a movie: The Fast and the Furious series was stalling until Vin Diesel came back for the fourth installment. And when they added The Rock for the fifth, it became the biggest entry yet. And for all of the money Fox is saving by making X-Men: First Class with a cheaper cast, they’re also paying Hugh Jackman movie-star money to do another Wolverine sequel. (Though they’re keeping costs down: A source tells us that the targeted budget for The Wolverine was $90 million.) The key to keeping superstars in your blockbuster is something called “the pool,” which drastically reduces the profit participation of big stars so that the studio is no longer left paying tens of millions of dollars to an actor for a movie that never made the studio a dime. The pool was designed about four years ago, when the DVD market started shrinking. Without that afterburner, studios were far more dependent on the box-office gross, of which the stars were grabbing an enormous chunk. The pool is a set percentage of the gross put aside to be divvied up by the film’s heavy-hitters after the movie breaks even; this as opposed to the first-dollar gross they used to get, through which they got paid even before the studio did. But neither is it net profit, which became a joke because it never existed: By factoring in everything from marketing and advertising costs to interest and distribution fees, studios claimed there was never a profit to share. Sony is currently enmeshed in a dangerously old-school A-lister-driven sequel: Men in Black 3, starring one of the biggest stars in the world, Will Smith. Currently (and eternally?) in production in New York, MiB3 has grabbed headlines lately with a metaphor for the production’s excess: Local residents have been loudly complaining about Smith’s city-block-swallowing, diesel-fumes-belching luxury trailer. But believe it or not, this installment has been on a crash diet compared with previous incarnations. Previously, Smith, Tommy Lee Jones, director Barry Sonnenfeld, producer Walter Parkes, and executive producer Steven Spielberg swallowed much of the first two films’ profits with their massive gross participations. Spielberg alone is thought to have made $100 million just from lending his name as an “executive producer” on the first film. The cost of the third installment is ballooning, as Smith (who is also the film’s producer) extended a planned hiatus to play screenwriter on a script that hadn’t been finished before the movie was rushed to a green light. But there’s one bright spot on the studio’s ledger: This time out, Sony was able to create a pool for gross participation, and limited it to 24 percent, with Smith taking the biggest chunk. It doesn’t reduce the massive budget any, or get rid of the Excedrin headache script problems, but at least Sony will be able to recoup far more of its investment when it finally opens. Which brings us back to Johnny Depp, the only major sequel star of the summer of 2011. One couldn’t imagine the Pirates franchise without him; he’s inarguably the only reason the movie became a franchise. But there’s far less of a chance that a star with his price tag would launch a similarly extravagant series today. And so he seems to have something cheaper in mind: As Vulture first reported, one of his next projects will be a remake of The Thin Man, the 1934 comedy whodunit with William Powell and Myrna Loy that spawned five sequels. Clearly, Depp sees not just a classic detective comedy to be remade (about yet another amusing, high-functioning alcoholic, to boot), but a potential new franchise for himself, too — and perhaps not a terribly expensive one at that. (One would assume that a Thin Man remake wouldn’t involve pricey battle scenes and CGI villains. That said, knowing Hollywood, it may well be set in deep space by the time it’s finished.) But at the rate things are going in Hollywood, Depp could safely ensconce himself in this for a while. Heck, he might even make it to The Thin Man 4: On Stranger Diets before they cast some unknown from Australia to replace him.